Sometimes at the end of a long day, all you want to do is sit down, take off your shoes, and get a nice, warm foot massage. We’re here to help so we did the research to find the best heated foot spa available. We soaked our feet and got pedicures just to find the right products for you. Before we get to our top 10 foot spa reviews, let’s take a look at what you need to know when shopping around. 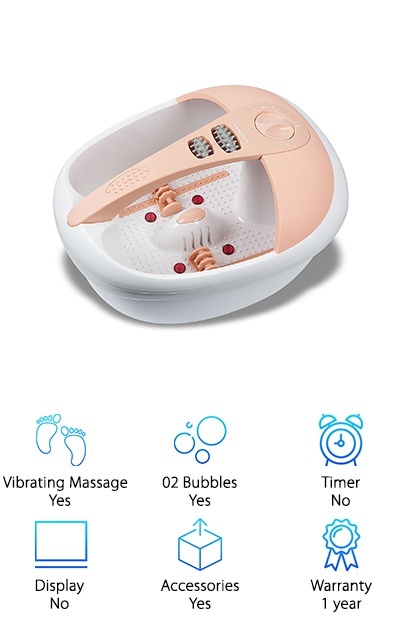 Vibrating Massage - There are a few different kinds of massages available with foot spas, but vibrating is one of the most popular and the most effective. They’re also one of the loudest. Just something to keep in mind. 02 Bubbles: A jet of oxygen bubbles can feel absolutely amazing. They travel through the water and make it almost effervescent while surrounding your feet. If you’re looking for a massage with a lighter touch, consider a foot spa with O2 bubbles. 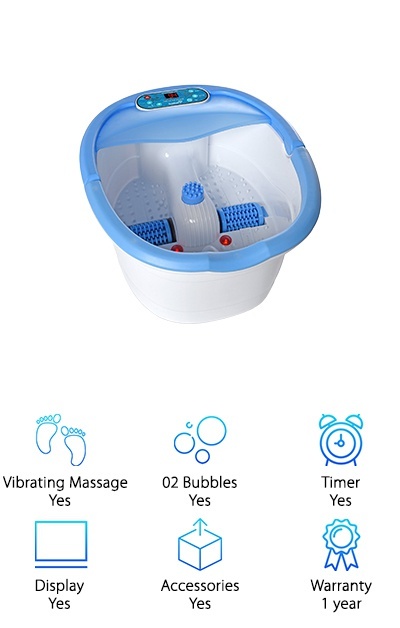 Timer: Some of the higher end models of foot spas have timers you can set to keep track of how long you’ve been soaking. Because when you’re that relaxed, it really is hard to figure out how much time has passed. Display: While some have a simple switch or knob, there are a lot of foot spas that have an LED display with multiple buttons and settings. Some of them were even designed so that you can operate them with your toes! Accessories: You’ll find a range of accessories! Everything from additional massaging rollers to pumice stones to toe separators! All of them are ways you can take your foot spa to the next level and add more massaging or even a pedicure. Warranty: When it comes to warranties, it’s just as important for you to know what is covered as it is to know what isn’t. Make sure you read the fine print so you know what just what to expect with yours. A long soak in the best home foot spa is an amazing thing to look forward to when you’re having a rough day at work. We highly recommend it. Now that you know the features to look for, let’s get into our reviews. If you don’t have a lot of time, make sure you take a look at the top pick and budget pick first. They’re both great products and will give you some idea of the variety you’ll find when you’re shopping. Our pick for best foot spa machine will make you wonder how you ever lived without it. What makes it so wonderful? For starters, it has 4 different massage programs. You can choose rolling massage, ozone therapy, air bubble massage, and heated water surfing. One of the best things about this heated foot spa is how deep it is. The water comes up to your calves so your entire foot gets immersed in the water. Plus, there are 4 motorized rollers on the bottom that massage away any stress and foot pain. And get this: it comes with a special herbal container where you can soak herbs or mix in bath oils to enhance your experience. All that and we still haven’t mentioned the simple draining system, double insulation, or castors for easy transport. 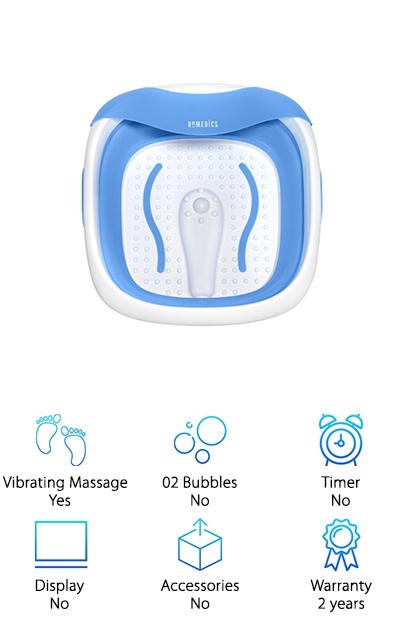 If you’re looking for the best at home foot spa for the money, this Compact Pro Spa from HoMedics is for you. This simple spa is really effective. Not only do you get a vibrating massage but the acu-node bottom surface gets the blood circulating to the soles of your feet, too. It’s designed to help hold the heat in the water, longer. One thing that’s cool about this one is that it’s collapsible which makes it really easy to store. But don’t worry! It only collapses when you want it to and has a spill proof feature to protect your floors. Not only that, it’s a generous size, too. It holds up to a men’s size 13. One more thing: it safe to use with Epsom salts if you want to! Maybe you think foot spas are boring and want to try something different after a long day on your feet. Well, have we got a surprise for you. This is definitely the most unique at home foot spa we came across in our research. Here’s how it works. 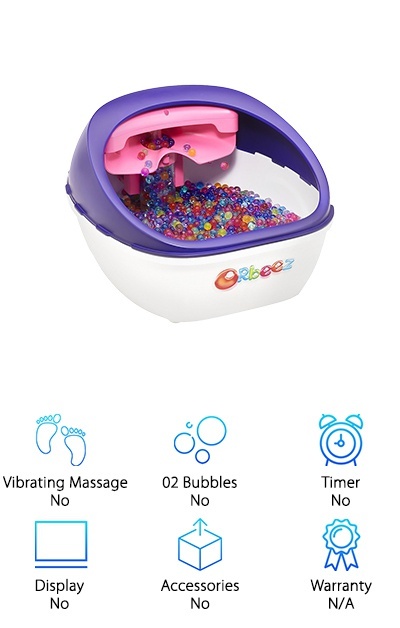 You get the spa itself and, along with it, little beads called Orbeez. Heat water in the microwave and add it to the spa with the Orbeez. Then, the coolest part of the whole process: watch them grow! The beads swell to 100 times their original size! When you turn it on, the spa will circulate the round, squishy balls over the tops of your feet. You can also rub the bottoms against them, too, to get your blood flowing. Comes with 2000 Orbeez! 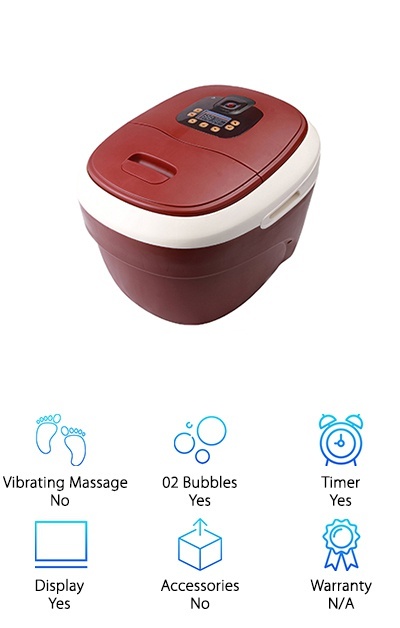 This best foot spa with heat has vibration and bubble massage options that, when combined with infrared, will make you forget about your long day. But that’s not all. The water heat preservation feature helps the heat last longer while a thermostat maintains a set temperature. You also get 2 removable massaging rollers, just in case you want to experience something a little more intense. And get this: there’s even a pedicure attachment to truly pamper yourself! No need to worry about getting water everywhere thanks to the non-slip rubber feet and splash guard protection. The shape of this one is unique, too. Why? There’s a handle integrated right into the top to help you carry it around. This makes it really easy to store out of the way when you’re done. This Ivation Foot Spa Massager not only helps you relax, but it helps you with salon-worthy pedicures. Thanks to the included acupressure and brush attachments, you can now get great looking results at home. That’s not all. Ivation made sure this foot spa had a lot to offer. Not only do you get a vibrating massage, but the bottom rollers make sure your entire foot gets the attention it deserves. The bubbles even make sure to get in between your toes. Add your favorite salts or oils for softer skin and calming aromatherapy to help you relax. It’s nice and roomy and actually goes up to your calves. What does that mean for you? Every last inch of your foot will experience the warmth and massaging power of this foot spa. 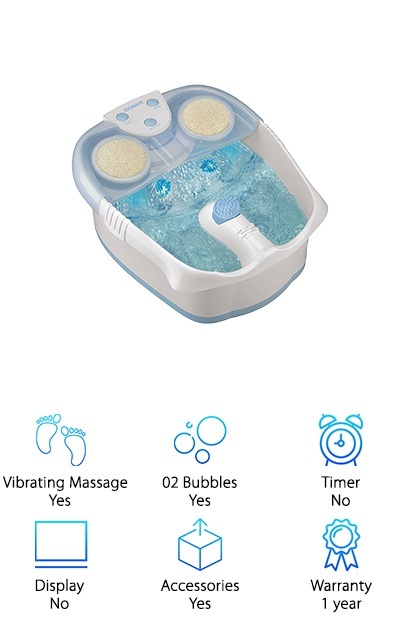 This Kendal All in One Foot Spa comes with something we haven’t come across yet in our reviews: a remote control. Now, you no longer even have to bend down to change the settings while you enjoy your foot soak and massage. The LED display is easy to read and setting the timer and temperature are simple. The motorized rollers give the bottoms of your feet a nice, firm massage. Want something a little less intense? 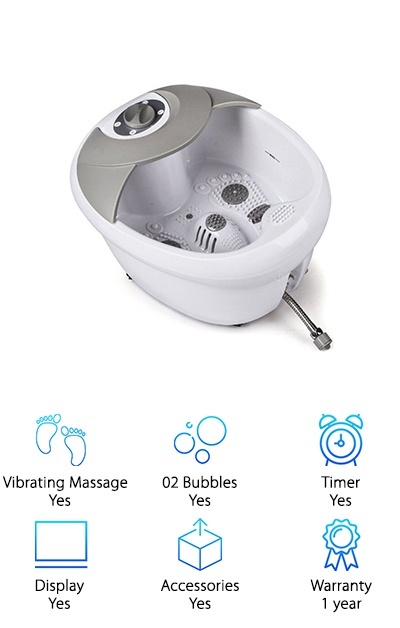 Try the bubbles, vibration, or water jets! Try one of the 3 pre-set combinations. This spa heats up fast and holds a steady temperature. If you have big feet, don’t worry, it can fit a men’s size 14. One last thing: it’s made of high-quality plastic, durable enough to handle the hot water temperatures plus general wear and tear. You know you’re going to have a relaxing soak when you don’t even have to bend over to use the control panel. That’s right. The display on this best foot spa from Conair was designed so that it can be operated with your feet. This is a simple foot spa that you can add Epsom salts, essential oils, or any bath soak to without having to worry about ruining any pump. Get a vibrating massage, oxygen bubbles, and a waterfall effect - whatever makes your feet feel the best. But that’s not all. You also get some cool accessories with this foot spa: a pumice stone, scrub brush, and soft-touch massager. Another great thing is this foot spa can accommodate larger feet. In fact, a men’s size 13 will fit comfortably with some wiggle room. 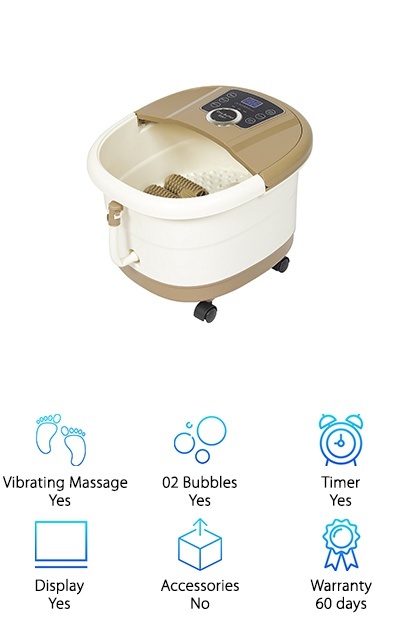 Are you looking for a simple foot spa machine that doesn’t have a lot of fancy features but still gives you an amazing foot massage? If that sounds like you, check this one out. The Sharper Image Foot Spa Massager gives you exactly what you need to get a nice, relaxing massage. The raised nodes along the bottom of the spa stimulate the soles of your feet to get your circulation going. You’ll also experience massaging bubbles that envelope your feet to help you kick back and relax. The ergonomic design not only helps your feet fit better and more comfortable, it also prevents spills. This is a great foot spa to use for pedicures, whether you’re looking for a way to keep your toes looking pretty between trips to the salon or if you want to DIY. Have you ever been so comfortable that you just don’t want to move? 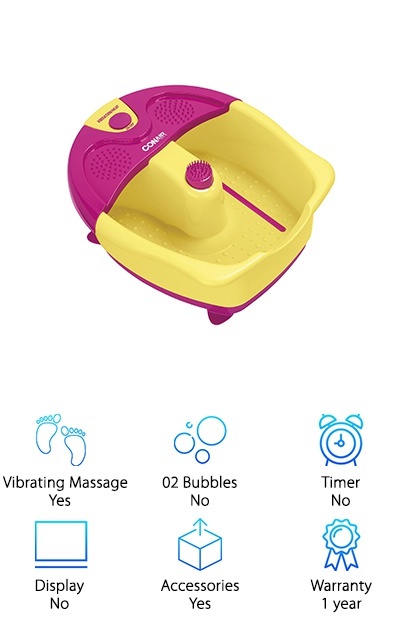 Well, the Conair SassyFeet Spa was designed with toe-touch controls so now, you don’t have to. Simply by using your foot you can turn on the vibration and activate the heat feature. 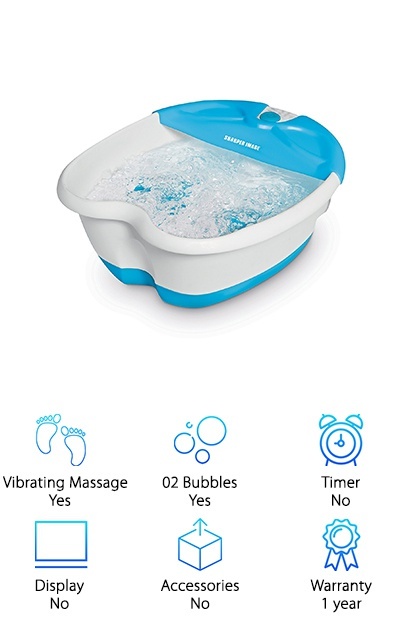 It comes with a massage attachment and has nodes on the bottom of the spa and on the splash guard. Want to know the best part? This spa was made for pedicures. That’s right. Included are the accessories you need to keep your toes looking pretty: toe separators, an emery board, and a pumice stone. Take in-home pampering to the next level. This spa will make sure you get an amazing foot soak and massage and give you what you need for a proper pedicure.